100% Pure Icelandic+™ Cod Fish Chips. With our Cod Fish Chips, you can treat your dog to a crunchy, all-natural snack that features just one ingredient—pure Icelandic cod (no additives, no preservatives and no supplements). They’re line-caught daily in the icy-cold waters of Iceland and are processed immediately for freshness you can count on without a heavy fishy smell. A rich source of Omega-3 fatty acids, these delectable dog treats promote healthy skin and a shiny coat. They also offer dental benefits, reducing tartar and plaque build-up for healthier gums and teeth. 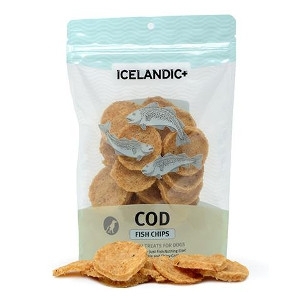 With a single source of protein—100% natural and edible Icelandic cod—these tasty treats are easy to digest and ideal for dogs with food sensitivities.